Click here for the news of the previous years. 03Apr19 1. The PM2.5 seems not to have been updated on the Airvisual cloud for a day, but the equipment works correctly here at meteoLCD. Problem seems to have been cleared today morning. 2. Installed new CAIRSENS O3/NO2 sensor (serial 5409) as a replacement for the old one which has come (or even exceeded) its normal lifespan of 1 year. These sensors are built to work without calibration (except 3 filter changes) for one year. Our experience (> 12 months) of the first sensor was very satisfying: the readings are in excellent conformity to the official ones. 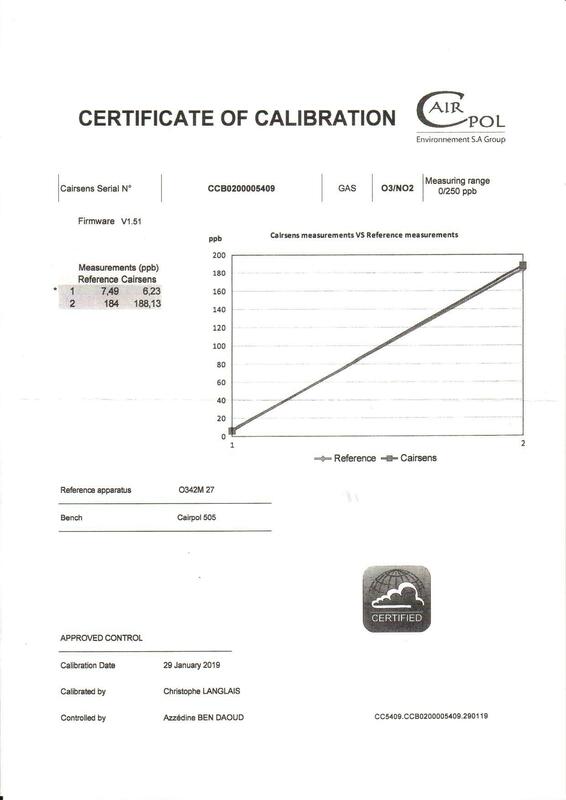 Calibration certificate here. 01Apr19 Backup station ok again. 29Mar19 The Thinclient comnputer driving the Davis Backup station is sick. Will be replaced asap. 25Mar19 Installed new AVM 1220E/1260E powerline/WLAN combo to drive the Airvisual PM2.5 sensor. 17Mar19 Again a problem with the Devolo Powerlink tying our Airvisual PM sensor into the Lan. The PLC looses contact with the AP installed in the Stevenson hut on the terrace, for no apparent reason. I will probably replace the Devolo system by a AVM PLC which uses all 3 wires (neutral, line and ground); an installation I made at home showed that this system works much better in dubious/complicated 220 VAC installations. 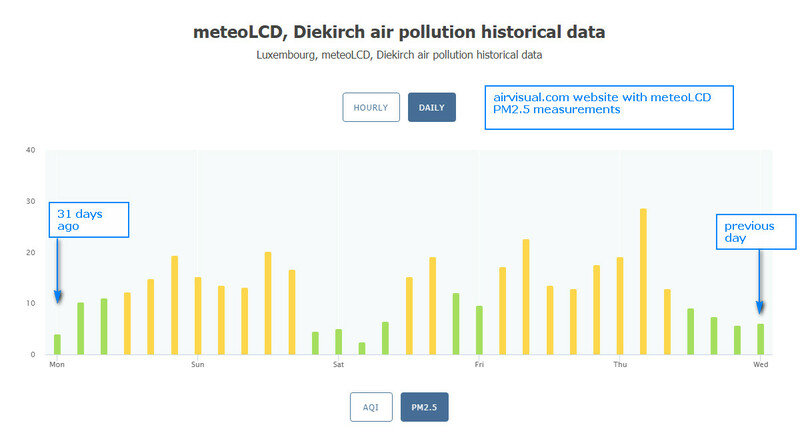 27Feb19 The axis orientation of our PM2.5 measurement at the airvisual.com website were a bit confusing (timing increased either from left to right or right to left). This seems now ok: click for annotated pictures of the hourly and daily graphs. 14Feb19 Trends 1998 to 2018 analysis finished! 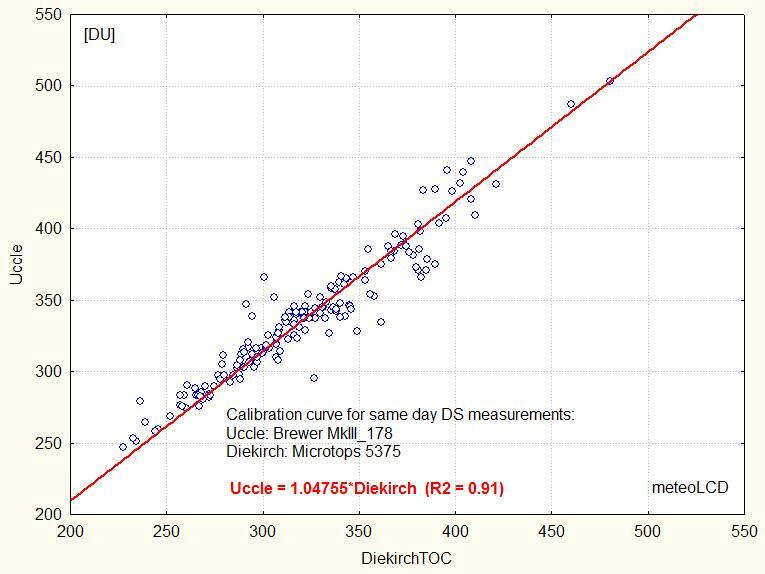 13Feb19 Look at the Dobson (Total ozone) page for two plots comparing the ozone measurements done at Uccle with the very expensive Brewer MkIII (serial 178) and our Microtops (serial 5375) instrument during 2018. 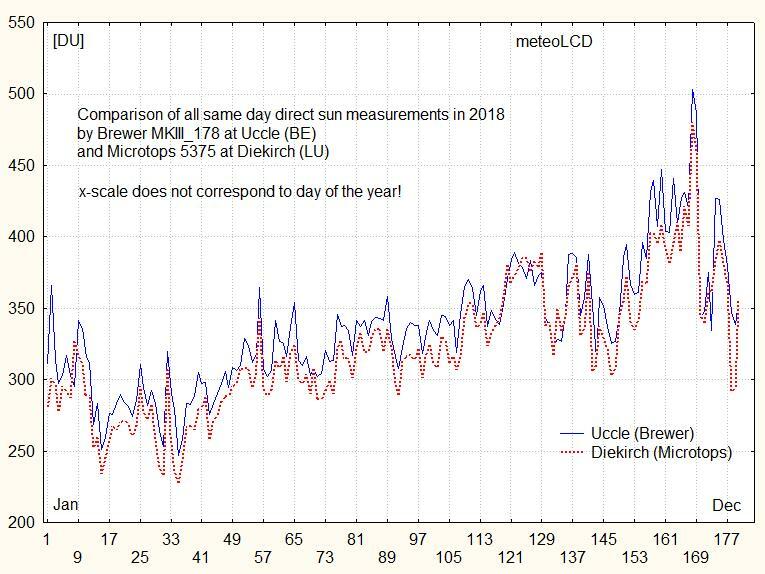 There are 180 same day, direct sun comparable measurements. The two series and the calibration curve. I think we can be very satisfied with these results! 01Feb19 Upload jan19.dat into data archive. 18Jan19 I started with the update of the trends section. This is heavy work and will take some time to finish. Updated sections are clearly marked as such. 10Jan19 The Airvisual web site of meteoLCD is now complete, with all data missing during the first days (like Temp, Humidity, ...) and forecast now present. Be aware that this map gives all available stations, without specifying wether they are official ones or come from the Airvisual community (for Luxembourg, meteoLCD is a community station, the others are those of the Environmental Agency). You might re-read my multi-part blog on air quality and AQI. 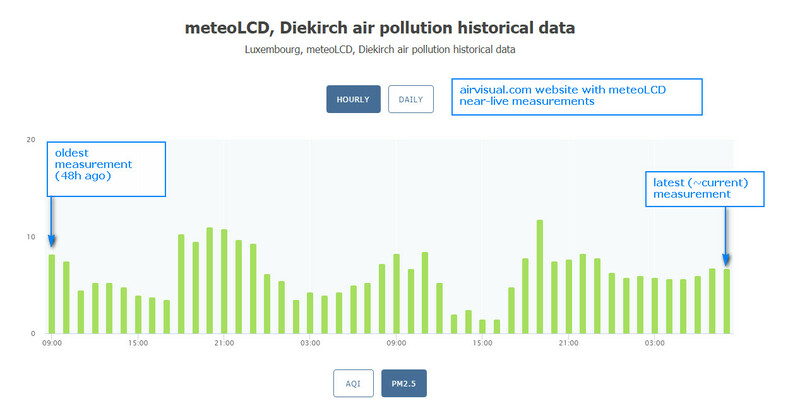 09Jan19 Big news: our Airvisual Pro station to measure air quality (essentially PM2.5 fine particles concentration) has been accepted into the world-wide Airvisual network of AQI stations. The reported AQI is the US AQI, as defined by EPA. This link will be added to the page of live data. Attention: on the hourly graph, the most recent values are at the left! The time axis decreases from left to right (don't ask why...) Monday 14 January: This unusual behavior has been changed: the time axis now shows the most recent hourly measurement at the right (time increases from left to right). 06Jan19 Added file 2018_only.xls to data archive. This file contains all the meteoLCD measurements of the year 2018, some statistics, daily and monthly values and comparisons with measurements done at the Meteolux station at Findel airport. 01Jan19 1. The usual dogs-dinner in the 7days plot due to Gnuplot problems with handling previous and new year (the logger files do not contain the year number). This will be self healing in the next 7 days. 2. Upload dec18.dat into data archive.